Successfully Added Peephole Camera - HD 3.0-Inch Display, 1MP Sensor, 145 Degree Lens, Take Pictures, 32GB SD Card Support to your Shopping Cart. Upgrade your front door and increase your security with this HD peephole camera. This security gadget can be easily installed on doors with a thickness of 35 to 100mm and that feature a peek hole of 15 to 25mm in diameter. If you live in an apartment, this compact security camera is perfect for you. This smart door camera packs a 1MP sensor through which it produces HD footage. 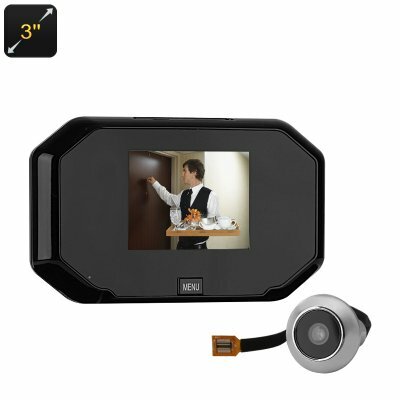 It furthermore comes with a 3.0-inch HD display that lets you check remotely who’s in front of your door. Thanks to this, you’ll always be able to see who’s ringing your bell without physically needing to be there. The 145-degree lens of this peek hole camera offers a wide view of all the outdoors. This allows you to clearly see anything that is happening on the other side of your door. From now on, you no longer have to be afraid of a person hiding out of view. Thanks to this security camera, you’ll never have to open the door for unwanted visitors again. Via its display, it even allows you to snap pictures of the person in front of your entrance. This provides you with the needed evidence in case somebody is trying to enter your property without having permission. The camera itself features a durable Zinc Alloy design. It looks exactly the same as any regular peek hole. Thanks to this, your visitors have no idea that they are being monitored by your security camera. The 3.0-Inch Monitor features a 32GB SD card slot. This provides you with enough storage to save previously taken security pictures. It can be easily charged through its USB power supply which means that your monitor will never run out of juice unexpectedly.